The Blue Jays moved away from the logo they used for 20 in 1997. From 1997-2012 the team has seen a variety of different logos and uniforms. The Blue Jays came back in 1994 riding a lot of momentum, after winning two World Series in a row and a walk-off home run by their Captain of Clutch, Joe Carter. They intended to defend the title for a third year. The off-season saw was relatively calm, and the majority of the Blue Jays core would return for the new season. Joe Carter continued to produce in the middle of the lineup and a rookie call-up by the name of Carlos Delgado was showing some good wood early on in the season. In fact, Cito Gaston, the teams Manager was extended in the middle of May to lead the team through the 1996 season. But after May, things went downhill very quickly. Juan Guzman, who was their opening day starter, pitched horrendously and Duane Ward’s season ended when he was required to undergo arthroscopic surgery on his shoulder. Carlos Delgado’s production fell off and both he and rookie shortstop Alex Gonzalez were returned to AAA. It was the first time in half a decade where the Blue Jays were not a dominant force in the AL East, and they fell back 16 games by the middle of August. That was when the Players Union Strike occurred, and the Blue Jays season ended with a dismal 55-60 record to finish 3rd in the AL East. -The Blue Jays premiered three of rookies during the 1994 season that would play a larger role later on in the team’s history: Carlos Delgado, Alex Gonzalez and Shawn Green. –Paul Molitor batted .341 for the Toronto Blue Jays in 1994. -Labatt Blue (principle owner of the Toronto Blue Jays) was bought out by the Interbrew (InBev) corporation of Belgium, sending the team’s ownership group overseas. The offseason heading into 1995 lasted a little bit longer than usual due to the Players Strike. But this allowed the Blue Jays to re-sign David Cone (who previously pitched for the team in 1992) and was coming off of a Cy Young award season. Pat Gillick, who had formed the Blue Jays enormously successful rosters during the late 80s and early 90s, resigned as the team’s General Manager. This effectively marked a new era in franchise history, with the beloved Gillick out of town and a new GM: Gord Ash. The late start finally took place on April 26th, after an agreement was made between the league and the Players Union. The teams core that won back-to-back world championships just two season’s prior was dramatically dissolved—only pieces remained. After the excitement of signing David Cone prior to the season, a losing record and falling out of contention caused the Blue Jays to trade him before the trade deadline. The Blue Jays received little in return for Cone other than salary relief, and Cone went on to pitch a perfect game for the New York Yankees. The losing season saw attendance at The SkyDome fall for the first time in 4 seasons, and the Blue Jays found themselves ending the year in last place: 30 games behind the Boston Red Sox. The shortened season only allowed for 144 games in which the Blue Jays went 56-88 and dead last in the AL East for the first time since 1981. The Blue Jays opened their season in Toronto with a tribute to two of their greatest players of all-time: George Bell and Dave Stieb. These two were honored as the original players to make the “Level of Excellence” at The SkyDome. Despite 1996 proving to be another mediocre season, the team at least finished in 4th place with a 74-88 record. It was the first year since 1993 that a full 162 game season was played in Major League Baseball. The season, despite not being a winning one, showed glimpses of hope for the future. Joe Carter and Juan Guzman were two of the few veterans remaining from the teams Championship days, and both returned to form after disappointing 1995 seasons. Guzman led the American League with a 2.93 ERA and Joe Carter hit 30 home runs and 100 RBI’s for the 9th time in his career. The year was viewed as an opportunity to let some of the teams talented prospects get some Major League “seasoning”, and Carlos Delgado was moved from the catcher position to get some time manning first base in Toronto. Alex Gonzalez starting flashing his leather at shortstop, and future leadoff superstar, Shannon Stewart, got his speedy spikes dirty. Of course, we cannot forget to mention that the Blue Jays had their franchises first Cy Young Award in 1996: Pat Hentgen pitched ten complete games and over 265.2 innings ended the season with a 20-10 record. Some of the things that occurred in 1996 shed some light on the promising future of the ball club. At the start of Gord Ash’s second season as General Manager, the Blue Jays made a change that had never occurred during their now 20 year history. The team moved away from the logo and uniforms that had been with them since their inception, and was re-branded for what Ash hoped would be a new beginning. The other proverbial fireworks set off by Ash were the signing of Roger Clemens to a 3-year deal. Clemens would end up winning the AL Cy Young Award in 1997, as well as the Pitchers, “Triple Crown”. He went 21-7 with a 2.05 ERA and 292 strikeouts…one of the best seasons ever by a pitcher (later on there would be allegations that he used PEDs during his tenure in Toronto). The Blue Jays were having their first decent season in a while and in the middle of July they made a big trade: the team sent pitchers Mike Timlin and Paul Spoljaric to Seattle in return for highly touted prospect, Jose Cruz Jr. Jose Cruz Jr., Shawn Green and Carlos Delgado ended up becoming the teams two big bats in the middle of the lineup (in addition to Joe Carter), but soon after the acquisition of Cruz, the season fell apart with a 76-86 record, which was good for last in the AL East. 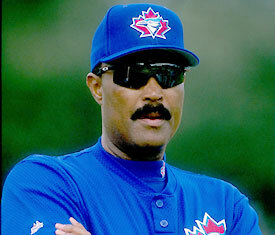 Long-time manage, Cito Gaston, was actually fired a few games before the seasons end. 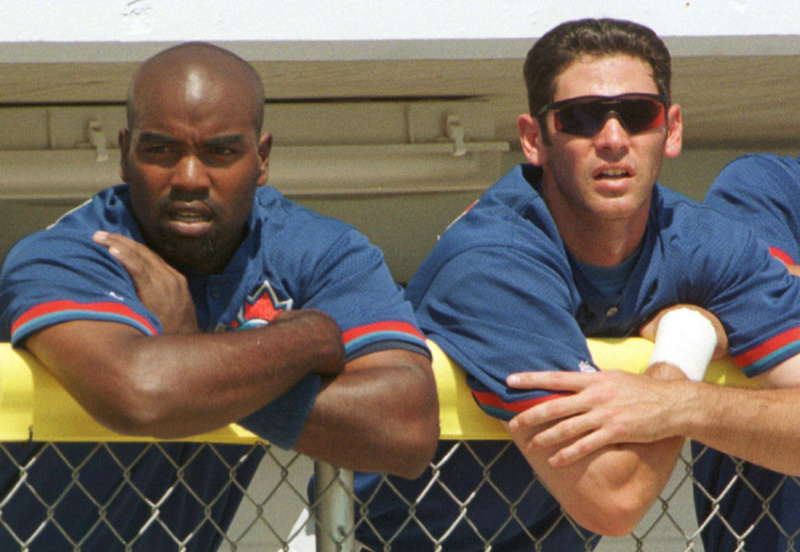 Carlos Delgado and Shawn Green composed one of the leagues scariest 3-4 duos. The two “bash brothers” consistently produced 0 HR/100+ RBI seasons (each). The Blue Jays started out the season with a new manager, former Blue Jay player Tim Johnson. They also boasted a new-look outfield of young future-stars. They had speedster Shannon Stewart along with the powerful and athletic Jose Cruz Jr. and Shawn Green to cover the green. The team also signed long-time Blue Jays, Tony Fernandez, as a free agent to re-join the team and he went on to lead the lineup with a .321 average. The team was absolutely loaded with power, as Shawn Green joined the 30/30 club, Carlos Delgado hit 115 RBI’s, and Jose Canseco mashed 46 home runs. Not to mention, Roger Clemens would end up winning his 2nd consecutive Cy Young Award, and the 5th of his career. Despite ending the season with their first winning record since 1993, (a respectable 88-74), the Blue Jays only managed to finish in 3rd place in the AL East. This was the famous 1998 season when the New York Yankees won a stunning 114 games. Tim Johnson reign as the Blue Jays manager only lasted the duration of the 1998 season. He was replaced in 1999 by Jim Fregosi, who would lead the team to their second straight winning season, and the 13th winning season in their 22 year history. The Blue Jays continued their upward trend and continued to display signs of hope for a competitive future. In fact, they were the leading for the AL Wild Card until a horrendous September changed their fortune. Still, their 84-78 record (3rd Place in the AL East) was a far cry from the losing teams the Blue Jays fielded just a few seasons prior. And the team did this without the ace that carried the team with 20+ wins for the past two seasons. Clemens was traded when his value was highest, to league rival the New York Yankees. Toronto received David Wells, Graeme Lloyd, and Homer Bush in return…three players who were at the height of their careers. David Wells had also just recently pitched a perfect game during his time in New York. The team also saw the duo of Shawn Green and Carlos Delgado established themselves as the fiercest 3 and 4 hitters in baseball at the time. The couple combined to hit 86 home runs in 1999. There were a number of notable things that occurred during the 99 season that would have major implications in the future. For starters, shortstop Alex Gonzalez would have to undergo arthroscopic surgery, which would alter his career path in Toronto tremendously. But the team also saw their first glimpse of top prospect Vernon Wells, who would go on to become the face of the franchise and one of the team’s best players. 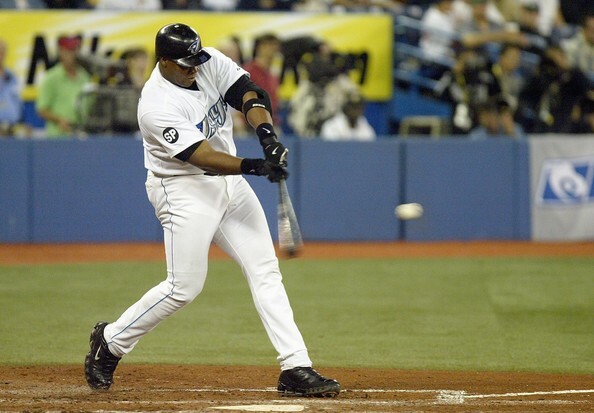 1999 was also the year that the Blue Jays acquired Tony Batista from the Arizona Diamondbacks. He was the team’s beloved third baseman with the unorthodox batting stance that would go on to have some surprisingly great seasons with the team. We also saw the emergence of fireballer Billy Koch, who put together a very successful season as the teams closer with 31 saves. Joe Carter and Cito Gaston’s accomplishments with the franchise were celebrated and the two were added to the “Level of Excellence”. Exciting news struck the organization when two new members of the Blue Jays would be announced at the beginning of the season: Mascots “Ace” and “Diamond”, a pair of fun-loving Blue Jays. In regards to more meaningful off-season moves, the Blue Jays made two major transactions. The team locked up their cornerstone player Carlos Delgado with a 3-year contract extension. But his “bash brother” Shawn Green, demanded a trade after having his most successful season yet. Toronto was able to send Green to the Los Angeles Dodgers and net another powerful right fielder, Raul Mondesi. The Blue Jays continued to earn their reputation of being a home run hitting lineup and in 2000 became the first team in MLB history to have four players all with 30+ home runs (Delgado, Batista, Mondesi, Fullmer). Despite the monster season put up by the teams players (6 players with 20+ homers, Delgado hit 135 RBI, and David Wells won 20 games), and a winning record, the team could not land a playoff spot. Late in the season, when it was apparent that a playoff run was out of the question, Rogers Communications Inc. went on to purchase 80% of the franchise from InBev, and soon after acquired 100% ownership. The team finished with its 3rd consecutive winning season, going 83-79 (good for 3rd in the AL East), and looking forward to a new ownership group that would hopefully lead the team back to into October. Fregosi was let go as the manager and the club hired long time announcer Buck Martinez to replace him for the 2001 season. Just before the trade deadline, the Blue Jays traded for Texas Rangers pitcher Esteban Loaiza. Who did they have to give up for this starting pitcher? The package included Darin Cubillan, and a young middle infielder named Michael Young. The Blue Jays entered a new era in 2000 when Rogers Communications Inc. bought the Toronto Blue Jays from InBev. One of the first changes that was noticeable was that The SkyDome was renamed, “The Rogers Centre”. With new ownership came organizational changes. Paul Godfrey would become the Team President and CEO, and former Blue Jay Buck Martinez would take over as manager of the team. Major transactions included the Blue Jays trading David Wells to the Chicago White Sox in return for Mike Sirotka, who had just had a standout season the year prior. In the middle of June, the team also reacquired Tony Fernandez, for the players 4th stint with the Blue Jays (he would also be inducted to the “Level of Excellence” later during the season just prior to his retirement). Fernandez retired as the teams all time leaders in games played, at-bats, hits, doubles, and triples. He also was the ALL-Time Leader in hits from the Dominican Republic at the time of his retirement, having passed Julio Framco. There were several good seasons put up by Blue Jays in 2001 (Jose Cruz Jr. joined the 30/30 club, Shannon Steward got 202 hits, Delgado hit 39 HR/103 RBI, and game in which Jeff Frye hit for the cycle) but the Blue Jays ended with their first losing season in several years. After going 80-82 (good for 3rd in the AL East), GM Gord Ash was fired, and replaced by J.P. Ricciardi who would quickly make his first move by trading Billy Koch to Oakland for prospect Eric Hinske (Ricciardi was previously the Assistant GM to Billy Beane in Oakland). 1B Carlos Delgado, 2B Roberto Alomar, SS Tony Fernandez, 3B Kelly Gruber, LF George Bell, CF Devon White, RF Joe Carter, C Ernie Whitt, RH starter Dave Stieb, LH starter Jimmy Key, Closer Tom Henke, DH Paul Molitor, utility player Rance Mulliniks and Manager Cito Gaston. 2002 saw some more changes and new milestones for the Blue Jays organization. Pat Gillick, the teams legendary General Manager was added to the “Level of Excellence” at The Rogers Centre (formerly The SkyDome). The team got off to a very rocky start, which eventually cost Buck Martinez his job as skipper. Management would hire Carlos Tosca, and sign him and his entire coaching staff to a two-year contract. The team ended up going 58-51 under Tosca’s leadership, and ended the season with a 78-84 record for their 5th straight 3rd place finish in the AL East. Eric Hinske, ended up as the American League Rookie of the Year, becoming the team’s second winner of this award (Alfredo Griffin). More importantly, however, a young Roy Halladay would be thrown into the position of being the team’s ace. He fell most gracefully into this role, going 19-7 and posting a 2.93 ERA. Carlos Delgado was once again the team’s leading offensive player, but a young 23-year-old Vernon Wells showed what kind of player he could be, and hit .275 with 23 HR and 100 RBIs. Following the season, General Manager J.P. Ricciardi would be offered a five-year contract that would keep him in control of the team through 2007. He accepted the deal, and hired Tony LaCava as his Assistant GM. 2003 was a year that the Blue Jays finally ended up back above .500 after several losing seasons. They went 86-76 for their 6th straight 3rd place finish in the AL East. Roy Halladay would end up leading the rotation with a 2207 record and a 3.25 ERA, winning the Blue Jays 4th Cy Young Award in franchise history. Carlos Delgado also led the major leagues in RBI’s (followed closely by teammate Vernon Wells) by hitting 42 HR and 145 RBI but finished second in AL MVP voting to Alex Rodriguez. The Blue Jays were a real surprise to critics who never expected them to be competitive, but they caught fire in May and June. After the All-Star game, however, the Blue Jays traded Shannon Stewart for Bobby Kielty, and their performance greatly regressed. The good news is that Bobby Kielty would later be traded to Oakland and the Blue Jays would receive Ted Lilly in return. Other notable performances belonged to Josh Towers, who went 6-1, Frank Catalanotto who batted .299, and Josh Phelps who hit 20 HR. The team introduced new uniforms and a new logo that sported the abbreviated nickname, “Jays”. 2003 had shed light on the potential the team had for a couple of months when they played really well. However, in 2004, The Blue Jays had their worst season since 1980. Their 67-94 record landed them in last place in the AL East, for the first time since the Tampa Bay Devil Rays had joined the league in 1997. The team had Pat Hentgen return to the rotation, but this proved to be a fruitless pursuit of nostalgia as he went just 2-9 with a 6.95 ERA. Injuries to all the core players, including Delgado, Wells and “Doc” Halladay caused significant missed time. The rotation relied on Ted Lilly and Miguel Batista to carry the team, and the two held their own. They also resorted to a young Josh Towers, who surprised everyone by pitching way better than anyone could have expected. Despite being one of the teams worst seasons ever, the 2004 season exposed fans to the likes of Russ Adams, Gabe Gross, Alex Rios, David Bush and Gustavo Chacin: All J.P. Ricciardi protégés who were regarded as the future of the team. With the team’s poor performance, Carlos Tosca was fired as manager in favor of first base coach John Gibbons. Roy Halladay was a savior in Toronto. He was nothing short of “consistently amazing”, and became the true franchise player. The Rogers Centre got a make-over during the 2005 off-season. The hard AstroTurf that covered the field for the past 28 season, was now replaced by soft, shock-absorbing “FieldTurf”. New displays were installed in the Rogers Centre outfield as well. The Blue Jays themselves jumped out of the gate in full force, having a great March and April, while the Red Sox and Yankees struggled. And they did so without their franchise player, Carlos Delgado, who the team lost to free agency in the offseason. Ted Lilly was having issues on the mound, but Roy Halladay was brilliant. A young Venezuelan pitcher Gustavo Chacin and Josh Towers had really picked up the slack. The Blue Jays fortunes changed, however, when Roy Halladay’s season was ended by a line drive that broke his tibia (he ended the season midway through with a 12-4 record, and a 2.41 ERA). The Blue Jays also lost their third baseman, Corey Koskie, with a broken finger. They were, however, pleasantly surprised by the young Aaron Hill who replaced him. We also saw Russ Adams have a successful first full season as the team’s shortstop, and Alex Rios emerged as a star while Orlando Hudson won his first Gold Glove. Shea Hillenbrand performed solidly as the team’s first base/DH and Vernon Wells his 28 HRs with 97 RBI’s while winning his second consecutive Gold Glove in Centerfield. The Blue Jays couldn’t keep their record about .500, ending the season 80-82 and back in their usual 3rd place spot in the AL East. J.P. Ricciardi had now been the GM for several years, and had seen a mix of promising seasons, horrible seasons, and mediocrity. He had just been given an extension in the off-season to be the teams GM until 2010. Ricciardi desperately had to make his mark on the organization that would define his legacy in Toronto, and he had to create some success in return for the trust given to him by the Blue Jays organization. The team went out and made some big splashes through both trades and free agency. Rogers Communications opened up their wallet and allowed Ricciardi to sign free-agent starting pitcher A.J. Burnett, and closer B.J. Ryan. Ryan had just had a breakout year in 2005 as the Baltimore Orioles closer and after one season of success, he was regarded as a top closer in baseball. They were also able to steal first baseman and double’s hitting machine Lyle Overbay from the Milwaukee Brewers, and slugging third baseman Troy Glaus from the Arizona Diamondbacks. The FieldTurf the team installed in 2005 was a big part of persuading Troy Glaus (who had knee problems and plantar fasciitis) to play in Toronto. The offseason transactions brought renewed excitement to the team before the season even started. The team actually had its best season under Ricciardi with 87 wins, and finished 2nd place behind the Yankees. Furthermore, there were 5 All-Star representatives from Toronto that July: Roy Halladay, Vernon Wells, Troy Glaus, Alex Rios and B.J. Ryan. The Blue Jays, however, fell short of the wild card and had to be happy with merely improving from their previous season. The Blue Jays opened up their wallets in 2006 and signed a lot of star players that could make a difference. In 2007, J.P. Ricciardi signed future Hall of Fame slugger Frank Thomas to a 2-year deal. The Blue Jays tried to build on the success they had in 2007 by adding legend Frank Thomas to a two-year deal that would add more pop to the lineup. Frank Thomas had just had resurgence in Oakland as their DH during the 2006 season, and the aging vet was just shy of 500 career home runs. This brought the exciting countdown to such a great milestone to Toronto along with a fan-friendly personality and good veteran presence in the clubhouse. After several years of high production out of Vernon Wells, the team decided to lock up one of its franchise players extending him a 7-year $126 million contract. The deal recently given to Carlos Beltran really set the market for the value of a gold glove, 5-tool centerfielder, and many people thought that Vernon Wells actually gave Toronto a “home team discount”. The Blue Jays managed another winning season in 2007, but did not live up to their own expectations. Alex Rios was the team’s only representative at the mid-summer classic (he actually earned second place to Vladamir Guerrero in the 2006 All-Star Home Run Derby Contest), and the team ended up with only 83 wins on the year, which was good for 3rd in the AL East. Part of this could be attributed to the fact that the Red Sox and Yankees had both made dramatic improvements to their rotations during the off-season, and the fact that the Blue Jays $50 million closer B.J. Ryan missed the entire season for Tommy John surgery. Other than Roy Halladay, the team largely relied on a smorgasbord of bargain-bin reclamation projects in John Thomson, Tomo Ohka, and Victor Zambrano to start games. We did, however see the emergence of Shaun Marcum and Dustin McGowan, two young arms who both won 12 games apiece. Aaron Hill also had a career season in almost all offensive categories and actually broke the record for most doubles in a season by a Blue Jays second baseman, previously held by the great Roberto Alomar. 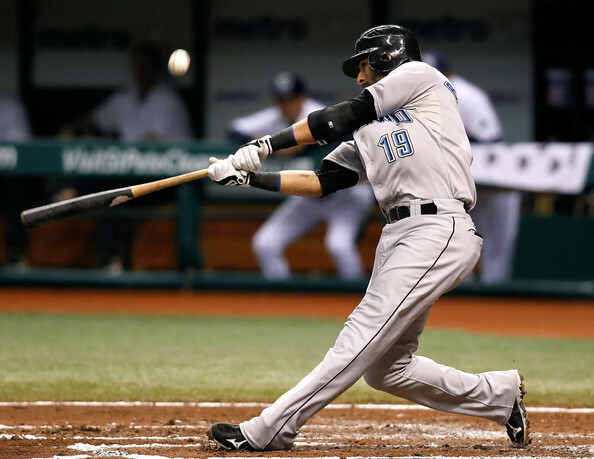 In April, General Manager J.P. Ricciardi rewarded Alex Rios for the strides he had made in the past seasons with a 7-year contract worth almost $70 million. The Blue Jays put up another respectable season in 2008 with 86 wins, which represented their 3rd straight winning season. Their record, however, was only good enough for fourth place in the American League East, as the Tampa Bay Rays had their breakout, “worst-to-first” season. The Blue Jays really moved away from their reputation as a team with an amazing lineup, and became a team with a relatively impotent offense, but the best pitching in baseball. Roy Halladay ended up being the teams only All-Star in 2008, having won 20 games with a 2.78 ERA, but he led a very impressive rotation and bullpen. A.J. Burnett had a career year and won 18 games while leading the American League with 231 strikeouts. Jesse Litsch and Shaun Marcum were two youngsters who pitched extremely well behind the 1-2 punch of Halladay/Burnett. After losing 5 games in a row in June, the team fired manager John Gibbons and re-hired Cito Gaston, who led the team to the back-to-back championships in 1992/93. Along with Gaston came a new coaching staff, including hitting coach Gene Tenace, who was able to extract some power out of the Blue Jays bats. The Blue Jays ended up finishing the season 51-36 under Gaston’s leadership, but their 86-76 record left them 11 games out of first place. At the end of 2008, longtime CEO Paul Godfrey announced he was stepping down and the club hired Paul Beeston as his interim replacement. Cito Gaston and his coaching staff also received 2-year contracts. Sadly, Ted Rogers of Rogers Communications—who had purchased the team in 2000—died in December at the age of 75. Towards the end of GM J.P. Ricciardi’s tenure in Toronto some moves needed to be made and Cito Gaston was re-hired to be the Blue Jays manager. Gaston was beloved in Toronto due to the success and winning seasons he brought during his first time around as the Blue Jays skipper. The Blue Jays uniforms donned two patches on either arm for the 2009 season. One patch was to honor Ted Rogers, the team owner who died in December, and another patch to memorialize the life of long time broadcaster Tom Cheek, who had also passed during the off-season. The Blue Jays had a hot start to the season and remained in first place until June when their season began to fall out beneath them. Alex Rios, who had failed to continue his ascension to be a top outfielder in baseball, was put on waivers by J.P. Ricciardi and claimed by the Chicago White Sox. The Blue Jays permitted the claim, shedding the over $60 million dollars they would have owed to Rios. Once again, Roy Halladay was a lights-out presence on the mound for Toronto and continued to be arguably the best pitcher in baseball. Both he and Aaron Hill represented the Blue Jays as All-Stars that summer. Aaron Hill had another huge season after a down year in 2008 and coupled with Adam Lind in the middle of the lineup. Aaron Hill won the Silver Slugger Award for second baseman, and Adam Lind, who really broke out in 2009 to hit .305 with 35 HR and 114 RBIs, won the Silver Slugger Award for Designated Hitters. Despite several positive notes about the season, the Blue Jays regressed in 2009 to a 75-87 record (good for 4th in the AL East). GM J.P Ricciardi was fired at the end of the season, and replaced by his Assistant GM, Alex Anthopoulos. Alex Anthopoulos took over as one of the youngest GM’s in baseball history and immediately was faced with a very controversial task. Roy Halladay was revered in Toronto as a demi-god and given a large part of his career graciously to the team by signing a team-friendly extension several years ago in order to avoid free-agency. The Blue Jays promised to make the team a contender if he stayed, and they had failed to do so. With one year left on his contract, and the knowledge that they were unlikely to re-sign him, Anthopoulos was forced to trade one of the franchise’s all-time favorite players in order to build a future for the team. The Blue Jays ended up trading Halladay to the defending National League Champion Philadelphia Phillies. In return they received top pitching prospect Kyle Drabek, catching prospect Travis D’Arnaud and outfielder Michael Taylor. The Blue Jays really wanted the Phillies to include Anthony Gose in the package, but couldn’t get them to agree. Michael Taylor was immediately shipped to Oakland by Alex Anthopoulos for hard hitting first base prospect Brett Wallace. Alex Anthopoulos also made a shrewd move in shipping reliever Brandon League to Seattle in return for former first round pick and hard throwing Brandon Morrow. Surprisingly enough, after just getting rid of the Blue Jays ace, the team saw a 10 game improvement during the 2010 season. Jose Bautista, who had been acquired in the middle of the season during 2008 by J.P. Ricciardi (from the Pirates in return for catching prospect Robinson Diaz), had a breakout season in 2010. Out of nowhere, the journeyman third baseman hit 54 home runs to lead the Majors and establish a new team record for most single season homers. The Blue Jays really returned to their reputation as a slugging team, and established a new team record with 257 home runs. 7 players—including Aaron Hill, Adam Lind, Lyle Overbay, John Buck, Vernon Wells and Edwin Encarnacion—had 20+ home runs each. The Blue Jays ended the season 85-77 in fourth place behind the Yankees, Red Sox and Rays. There were highlights to the season, however, including Brandon Morrow’s one hitter, and catcher J.P. Arencibia’s MLB debut in which he went 4-5 with 2 home runs. GM Alex Anthopoulos made a number of prudent moves before the trade deadline during the 2010 season. He sent shortstop Alex Gonzalez to Atlanta for the highly regarded young shortstop Yunel Escobar, who had fallen out of grace with the Braves brass. Anthopoulos also acquired Anthony Gose (the third player they coveted from Philadelphia in the Roy Halladay trade), in return for Brett Wallace. Anthony Gose had been traded by the Phillies to Houston to obtain Roy Oswalt, and the Blue Jays sent Wallace, who they received in return for Michael Taylor, that they received from Philadelphia in the Halladay trade. Effectively, by the transitive property, Anthopoulos closed the Halladay deal receiving the prospects he insisted on by making this move. Cito Gaston’s contract ended at the end of the 2010 season, and he expressed he had no desire to re-sign as a manager. 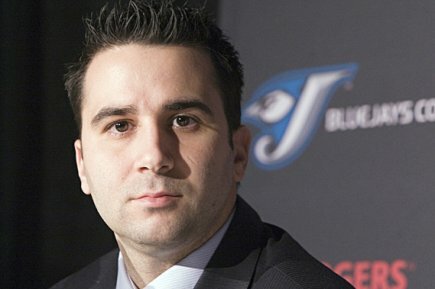 Alex Anthopoulos replaced J.P. Ricciardi as the Blue Jays General Manager and currently remains in that position. He has been nicknamed, “The Silent Ninja” due the manner in which he works and creates creative transactions that surprise the baseball world. Anthopoulos has made a myriad of moves and re-shaped the direction of the Blue Jays organization to one that possesses great hope. Ultimately, it is possible that he might rival Hall of Famer Pat Gillick as the best GM in Blue Jays history. The Blue Jays elected a new manager to lead them in 2011: they signed the Red Sox pitching coach John Farrell, and signed him to a 3-year deal. Anthopoulos was a busy man in the offseason and also signed superstar Jose Bautista to a very team friendly extension worth $64 million over 5 years. He sent Shaun Marcum to Milwaukee after a career year and netted one of baseball’s top prospects and Canadian native, Brett Lawrie. Alex Anthopoulos also pulled off another stunt that was seemingly impossible: he shed the payroll burden associated with Vernon Wells and his giant contract. Vernon Wells had a string of injuries and seriously under-performed since signing his $126 million back-loaded contract. Alex Anthoupolos somehow convinced the Los Angeles Angels to assume responsibility for the remainder of this contract in return for Mike Napoli and Juan Rivera. Juan Rivera was a salary dump for the Angels, but just a drop in the bucket compared to what Vernon Wells was owed. Mike Napoli was traded by Toronto to Texas due to a logjam of catchers in Toronto, and he went on to have a career season. The trade completely altered to financial future of the Blue Jays organization and earned Alex Anthopoulos the nickname “The Silent Ninja”. Nobody saw the trade coming, and Anthopoulos instated an organization rule not to discuss any rumors of transactions with media sources. The Blue Jays ended up finishing 2011 with an 81-81 record (good for 4th in the AL East), but there were lots of bright spots that Blue Jays fans could look forward to going forward. Jose Bautista improved on his 2010 season by batting .302 with 43 home runs and 103 RBIs. Ricky Romero stepped up as the team’s ace and filled the void created by Roy Halladay’s departure. He was an All-Star representative for the Blue Jays with 15 wins and a 2.92 ERA—he finally became the pitcher people expected he could be. J.P. Arencibia set a team record for catchers with 23 home runs in his first full season in the Major Leagues. In August, the Blue Jays called up top prospect Brett Lawrie. Lawrie gave Blue Jays fans a lot to look forward to with his all-out style of play and mentality. It didn’t hurt that he hit 9 home runs during his two months in Toronto either. GM Alex Anthopoulos remained busy towards to end of the season, doing his due diligence, checking in with other GM’s and making trades to build a new generation of Blue Jays winners. One of the top prospects in all of baseball had fallen out of favor in the St. Louis Cardinals organization. The Blue Jays needed a young, star centerfielder to replace Vernon Wells for the foreseeable future, and the St. Louis Cardinals were in a playoff race seeking relief pitching help. The Blue Jays had a wealth of relief arms that they included along with outfielder Corey Patterson in a three team trade, and received top prospect Colby Rasmus in the deal. The Blue Jays also traded Aaron Hill, who had fallen from grace, to Arizona for second baseman Kelly Johnson. Prior to the 2012 season, the Blue Jays revealed their new logo and uniforms. Their new logo was an updated version of their classic Blue Jay logo, and created a sense that the Blue Jays were ready to return to greatness. The Blue Jays now possessed a strong core of young and controllable players at the major league level, and arguably the top farm system in baseball. When J.P. Ricciardi left the organization, the team had one of the worst farm systems in baseball. Alex Anthopoulos immediately hired more scouts than any other team had, and recruited the best talent assessors in baseball. The team also invested heavily in a state of the art training center in the Dominican Republic and has spent considerable time recruiting internationally. But one of the things that really allowed Anthopoulos to change the farm systems destiny so quickly was that he had discovered a flaw in Major League Baseball’s policy. He realized that he could hoard Type-A and Type-B free agents at the August trade deadline, and then offer the players arbitration in November. If they declined the arbitration offer, Anthopoulos would receive draft picks as compensation. Well, prior to the 2012 season the MLBPA re-drafted the leagues rules, effectively ending Anthopoulos’ party. The Blue Jays would have to focus more on winning now. The team started out with high expectations as they had a really nice core of young talent together in Toronto. Ricky Romero and Brandon Morrow were a formidable 1-2 punch on the mound, and there was a lot of young talent to fill out the rest of the rotation. Rasmus, Lawrie, Arencibia and Escobar were youngsters that were just waiting to become stars. Bautista, of course, was the premier slugger in baseball. The real surprise in 2012 was Edwin Encarnacion’s breakout to become a 40 home run threat in the middle of the lineup, while racking up doubles and batting almost .300. But the disappointments outweighed the positives during a season that began with promise. A huge wave of injuries hit the team, including three of the Blue Jays starters in 3 consecutive games. Jose Bautista’s season ended half way through when he hurt his wrist on a follow through. Brett Lawrie and Brandon Morrow missed time while Kyle Drabek and Drew Hutchinson had season ending surgeries. Closer Sergio Santos, who the team had acquired prior to the season to strengthen their bullpen played 5 games before missing the rest of the season. It was evident that the team was not going to contend in 2012. Late in the season, Anthopoulos sent fan-favorite, and former top prospect Travis Snider to Pittsburgh in a surprise move during the middle of a game. Snider brought back another first round pick in Brad Lincoln, a starter who was converted to a relief role and had really hit his stride during the season in Pittsburgh. Anthopoulos then went on to trade more young left fielders (in addition to Snider) to receive more young, affordable relievers. Eric Thames was sent to Seattle for Steve Delabar, and Brandon Lyon, J.A. Happ and David Carpenter were acquired from Houston for a package of prospects. The team ended its season with an air of disgust surrounding the organization with a 73-89 Record and 5th straight 4th place finish in the AL East. Injuries had plagued what was set to be the teams return to greatness, and clubhouse issues had become present late in the season. Manager John Farrell, who was formerly a pitching coach in Boston, was being courted as the Red Sox future manager to replace Bobby Valentine. Talks circulated all over baseball until the season ended, and finally the trigger was pulled. Anthopoulos traded manager John Farrell to Boston for utility man Mike Aviles. Jose Bautista is the leader on the Blue Jays team, and arguably the premier slugger in all of baseball. The Blue Jays are nicely set for to make a strong run at contention for the next several years. Along with Edwin Encarnacion and a strong supporting cast of hitters, Bautista leads a strong lineup that will beautiful compliment an elite pitching staff. At the point of writing this, it is the end of December and season is still far off. But the Blue Jays have already may many monumental moves early in the offseason. The Blue Jays traded Mike Aviles who was acquired for manager John Farrell to the Cleveland Indians along with Yan Gomes for reliever Esmil Rogers. They also signed second baseman Macier Izturis to a 3-year $9 million deal. The Blue Jays then went on to make one of the biggest blockbuster trades in the history of baseball. They received Josh Johnson, Mark Buehrle, Jose Reyes, Emilio Bonifacio and John Buck from the Miami Marlins in return for a package that included Yunel Escobar, Adeiny Hechevarria, Jake Marisnick, Justin Nicolino and other prospects. This move completely changed the Blue Jays rotation, adding ace Josh Johnson in front of Brandon Morrow, and work horse Mark Buehrle as the team’s new number 3, in front of Ricky Romero. It also put arguably the game’s best leadoff hitter in a lineup in front of Jose Bautista, Edwin Encarnacion and Brett Lawrie. The deal represented a huge commitment from the team to spend the money they promised fan they would spend when the time presented itself. But two days later, Anthopoulos went out and signed Melky Cabrera to a 2-year $16 million deal. This put an end to the teams concerns about who would replace the platoon of prospects in left field that were recently traded. Melky Cabrera was a controversial signing because he was the league’s best hitter in 2012, prior to being detected for PED use. He does, however, fill in the number two hold nicely behind Reyes, with his speed and high-contact approach to hitting. The Blue Jays announced the re-hiring of John Gibbons as the teams new manager for 2013. As we sit now, in November, it is said that the Blue Jays are not done making moves for this offseason and would like to add more pitching help. The Jays will be looking to take themselves off of the three remaining teams list-that have not made the playoffs since the 1994 strike (KC/PIT and TOR) next year. -11 straight winning seasons from 1983-1993. -1st team North of the Border to win the Title. -1st team to in the MLB ever to draw 4 Million Fans. Roberto Alomar #12 Alomar is the only one to have his number officially retired and is the first Blue Jay to enter Cooperstown as a Blue Jay. Posted on November 28, 2012, in MLB Historical Series, MLB Teams: Articles and Analysis, The Rest: Everything Baseball and tagged a-rod, a.j. burnett, aaron hill, ace, adam lind, AL East, alex anthopoulos, alex gonzalez, alex mednick, alex ríos, alex rodriguez, alexander ewing mednick, anthony gose, b.j. ryan, big hurt, billy beane, BJ Birdy, blue jays, bobby valentine, brad lincoln, brandon lyon, brandon morrow, brett lawrie, brett wallace, buck martinez, carlos beltran, carlos delgado, Cito gaston, colby rasmus, cy young, dave stieb, david carpenter, david cone, david wells, Devon White, Diamond, Duane Ward, edwin encarnacion, emilio bonifacio, eric hinske, esteban loaiza, Franchise Series, frank thomas, george bell, j.a. happ, j.p. arencibia, j.p. ricciardi, jake marisnick, jerry howarth, jim fregosi, jim hughson, JImmy Key, john gibbons, jose bautista, jose canseco, jose cruz jr, jose reyes, josh johnson, juan guzman, justin nicolino, kelly johnson, kyle drabek, lyle overbay, mark buehrle, melky cabre, melky cabrera, michael young, mike aviles, mike timlin, pat gillick, Pat Hentgen, paul molitor, paul spoljaric, philadelphia phillies, phillies, raul mondesi, ricky romero, roberto alomar, roger clemens, rogers centre, roy halladay, shannon stewart, shaun marcum, shawn green, shea hillenbrand, skydome, steve Delabar, ted lilly, Tom Cheek, tony batista, tony fernandez, toronto blue jays, travis d'arnaud, travis snider, troy glaus, vernon wells, yunel escobar. Bookmark the permalink. 3 Comments.